List of 63 news stories. THREE wonderful concerts means THREE chances to enjoy our talent musical performers! Wed., Apr. 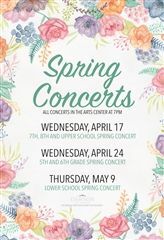 17, 7-12 Choral/Band concert, Wed., Apr. 24, 4-6 Choral/Band, and Thur., May 9, K-4 Music. PLUS - preceding each event, plan to arrive a bit early and peruse the wonderful visual art on display, a special show from our amazing visual artists in grades 7-12. 6:00p Art Show/reception, 7:00p Concert. Enjoy! Dawson is delighted to welcome guests from Europa International School in Sevilla, Spain! The two schools have had a long partnership. This year, four students will live with Dawson families for a month and be a part of our community, from classes to prom. Please reach out and make them feel welcome! Dawson is delighted to welcome our exchange students from Chongqing Yucai Secondary School! They will be spending the week as part of our community; please make them feel welcome! 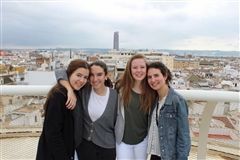 Did you see what everyone was up to during Winterim and Immersion programs? The 2019 blog is still up - link on the homepage and in the Portal. There was cool stuff happening, near and far. Surf through and check out everybody's adventures! Dawson is in the self-study phase of re-accreditation. As part of this effort, after a year-long process with faculty, staff, and trustees, Dawson has approved a new Mission Statement. "Dawson School is dedicated to excellence of mind, body, and character. We prepare students, through challenging and relevant learning, to become creative, resilient problem-solvers who bring their best to the world." We are proud to implement this statement as a full reflection of Dawson's program and goals. Dawson School challenges its students to achieve excellence not only in mind and body, but in character. The school adopted four virtues years ago as points of emphasis and focus for us all: respect, compassion, courage, and integrity. Every day, our campus strives to live these values, through gestures big and small. Which virtue did you exemplify today? THE PONY EXPRESS NOW OPEN! The cafe next to the Learning Commons - The Pony Express - is now open! From 7:30-10:15 a.m. and from 1:45-3:45 p.m., there will be drinks and snacks available for purchase. 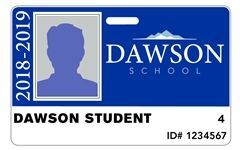 Everyone with an ID card - students, faculty, staff - will be required to purchase using that card and an Express Pay account; watch for details on how to sign up! February 4-8 is SPIRIT WEEK! THEMES: Monday is PJ Day, Tuesday is Famous Character/Celebrity Day, go wild on Wacky Wednesday, Thursday is Safari Day, and dress in your team's color on Friday!! And don't forget to bring items for A Precious Child donation - help out, AND earn team points! Spirit Week means DAWSON ROCKS! Starting Monday, hunt for the 11 DAWSON ROCKS hidden outside, all over campus. Find a rock... bring to any admin desk... get a selfie with rock, and give your name and team color... win points for your team! STUDENTS - Keep your ID cards! STUDENTS: ID cards are being distributed, and you need to actually keep and carry it! There is an ID number on the front, and a bar code on the back; these are used to check out library materials, A/V equipment, and in the future, at the new cafe in Henderson Hall. Be sure to hang on to that card - thanks! The Learning Commons is Open! Dawson's new Learning Commons is open and popular already! There are wonderful spaces for solo and group learning, and a multitude of resources for research and study. Plus it's a gorgeous place to hang out with some of the best views on campus. Digital Literacy guru Tina Hefty calls it home base, as do our learning specialists and IT team. A place for study, collaboration, support, inspiration, and community. Thank you to our Campus Growth early donors and the Alexander Dawson Foundation for bringing this to Dawson! We are delighted to announce that Dawson was recognized as the best private school in the region in Boulder Weekly's "Best of Boulder" poll for the 13th year. We are honored to have so many people recognize the value Dawson brings to the community, and the importance of excellence in education. DRACULA'S COMING! 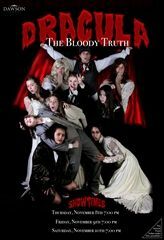 November 8-9-10, 7:00 p.m.
Mark your calendar for DRACULA, the Dawson Upper School Theater's fall play. A hilarious take on this classic tale. Performances Thursday - Friday - Saturday, November 8-9-10, at 7:00 p.m. in the Arts Center Theater. Rated PG for fake blood. Don't miss it! Dawson is always trying to enhance safety on campus, and to ensure our community is prepared in the unlikely event of a campus emergency. 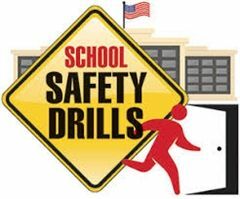 Beginning in October, there will be Lockdown Drills in October, February, and April, Tornado Drills in April and May, and Fire Drills monthly. Please follow instructions quickly and calmly - thank you! Dawson College Counseling is pleased to welcome over 150 colleges and universities to campus to meet with students and staff this fall. We are proud of our relationships with these fine institutions, and of the remarkable students they come to meet. Welcome - we're glad you're here! In honor of fall Spirit Week, do you know all of the words to Dawson's school song? with our colors white and blue. linked in purpose, side by side. Hail to Dawson all the way! 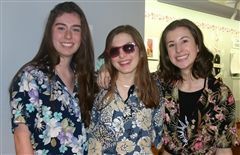 DRESS UP DAYS: America Monday, Tropical Tuesday, Pajama Wednesday, Throwback Thursday, Blue & White/Dawson Friday! 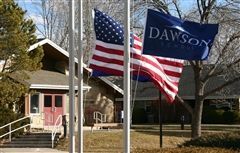 Dawson School was recognized as the #1 Best Private K-12 School and Best Private High School in Boulder County by users of Niche.com's Best Schools guide. Dawson also earned top 5 for Best Private K-12 School in Colorado. Niche combines rigorous analysis with authentic reviews to highlight the best schools, companies, and neighborhoods, and Dawson is honored to be recognized. August 21 Dining Commons Grand Opening Celebration! EVERYONE IS INVITED! On Tuesday, August 21, from 5:00 - 7:00 p.m., the whole Dawson community is invited to celebrate the opening of our wonderful new Dining Commons. Students, families, faculty, staff, alumni: Plan to join us for great food, live music, friends, and fun. Try out our new campus gathering spot, and get a taste of what's next! 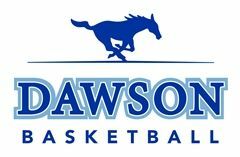 Dawson's graduation ceremony is Saturday, May 26, at 9:30 a.m. in the tent adjacent to the Athletic Center. Special guest speaker: Julia Blocher '06. Everyone is welcome and encouraged to attend as we celebrate this wonderful milestone. Congratulations, Class of 2018! Dawson School has been voted Best Private School in the annual "Best of Boulder" poll for the 12th year in a row! We are pleased to receive this recognition by the wider community, and glad to be an important contributor to what makes Boulder County special. Thank you! FUSION 2018 is here! Dawson's annual literary magazine is packed with over 100 written and visual works by our talented students, grades K-12. Fusion 2018 is published online: Look for an email with the link, or use the link on the Dawson homepage. Find some time to thoroughly peruse - and thank you to all who submitted work! DAWSON: LIVE! On Wednesday, May 23, from 6:00-8:00pm, bring the family and blanket/lawn chair to the Arts Center Lawn for a fabulous evening of music, food, friends, and fun. FOOD TRUCKS - starting at 5:00pm, get wood-fired pizza, tacos, hot dogs, handmade pizzelles and caramel corn; also ice cream treats and sno-cones. DAWSON 7-12 CHOIRS AND BANDS perform, alongside guest artists Ritmo Jazz Latino and Sharp 5! Perfect way to end the year. Don't miss it! May 21-23 from 7:45am - 4:00pm, the LS Library will host the annual Used Book Sale! Books from LS and MS/US Libraries cost just $.50-$2 -- and you can fill a shopping bag for $5! All proceeds benefit Dawson libraries. Stock up on summer reading! Celebracion 2018 All-School Potluck April 27! FRIDAY, APRIL 27, 6:00 P.M. It is Celebracion 2018! Dawson's Upper and Middle School HERO Clubs invite EVERYBODY - students, faculty, parents, siblings, grandparents - to an all-school potluck in Henderson Dining Hall. Bring a dish to share that reflects your heritage; beverages and dessert provided. Enjoy a fantastic feast with friends plus wonderful entertainment. Don't miss it! Have an old bike around, not being used? A student-run BIKE DRIVE is set for Wednesday, May 2. From 7:45-9:00a, bring the bike - any kind / size - to the front of Henderson Hall. The bikes will be shipped to Africa to aid people in getting to healthcare resources through Bike 4 Humanity. Dawson will be holding an information night on fracking on Thursday, April 26, at 6:30 p.m. Presenters will include chief planner from Boulder County on the status of proposed projects in our area, and members of the team who completed a National Science Foundation study on the health effects of fracking. RSVP link on Dawson homepage. Wednesday, April 18, is PURPLE DAY! 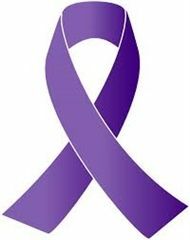 Wear purple, and buy purple donuts and purple smoothies, all to raise awareness for cancer and cancer research. Thank you, Helping Hands Club, for putting on this annual event. Bring a few dollars to donate for donut/smoothie if you can - and be sure to wear purple! 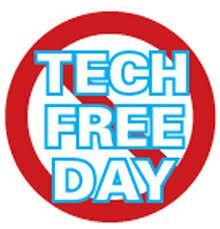 Dawson will be holding a campuswide Tech Free Day on Wednesday, April 18! Don't panic: Everyone can use devices before and after school - just not during the school day. Classes will use non-tech learning, and staff will work on non-tech projects. The goal is for all of us to focus for a day on in-person interactions. PARENTS: Expert Ryan Dawson will give a talk on screen use that day at 9:00am. Celebrate the Rainbow! A fun painting party, initiated by Dawson's GSA club, was held last week, resulting in our awesome new colorful crosswalk - a great way to remind ourselves to be welcoming and inclusive. Love our Dawson community! Dawson actively promotes and embraces the exchange of diverse perspectives, experiences, and backgrounds through curricular design, community involvement, and the integration of our four virtues – respect, compassion, courage, and integrity – into every aspect of our community life. 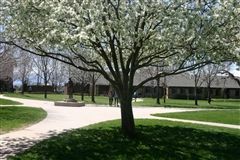 It is our responsibility to provide a safe and inclusive learning environment for all members of our community, regardless of race, ethnicity, gender identity, sexual orientation, socioeconomic status, age, ability, or religion, as well as to cultivate in each student the ability to make empathetic, socially responsible decisions. 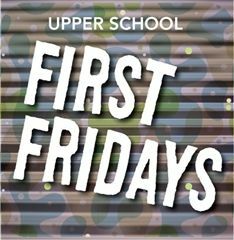 The first school-day Friday of each month, from 8:00-8:30 a.m., you can find a special kind of mayhem going on in the Henderson Student Center. Generally involves food - could be music - definitely laughter - and most definitely a great sense of community. Yes, it means rolling out of bed a half hour early. Totally worth it! Congratulations to 6th Grade Band, who kicked off the Mile High Jazz Festival with a performance at CU's Macky Auditorium! 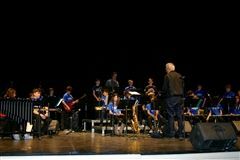 They gave a fantastic performance as part of the three-day event that showcased school bands from across the state. Dawson Offers New "Distinction in Coding and Innovation"
Dawson recognizes the interest and demand for skills around the creative use of technology: Interested Upper School students can now earn special recognition on their transcript if they meet the requirements of a new Disctinction in Coding and Innovation. Students will finish the program with a mastery of several programming languages, will have integrated creative technology projects into classwork, and will creatve five major programming projects. Contact Mr. Nickerson for more details. 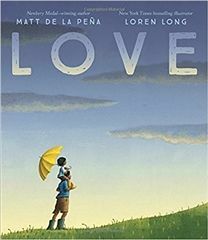 Matt de la Pena, Newbery-winning author of Last Stop on Market Street (only the second picture book in history to win the Newbery Award) and renowned illustrator Loren Long (Otis), came to Dawson to talk about their new joint book, LOVE, with Lower and Middle School students. This visit follows on the heels of the visit by popular children's author Chris Grabenstein, and continues special opportunities to get unique insights into the literature they read. 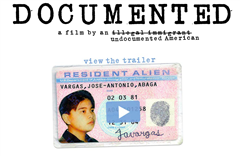 On Thursday, February 1, at 6:30 p.m., Dawson is pleased to be holding a screening of "Documented," the documentary from Pulitzer Prize-winning journalist Jose Antonio Vargas, followed by a discussion with a panel of experts, to explore the issues of DACA (Deferred Action for Childhood Arrivals) and immigration. Guests will include a representative from the Colorado Immigrants' Rights Coalition, a DACA recipient, an immigration attorney. This evening is free and open to the public. Seating is limited, so RSVP required: Go to the link on the home page of the Dawson website to reserve your seats. Did you know that Dawson has ELEVEN basketball teams?? Upper and Middle School, girls teams and boys teams: There is basketball excitement, home and away, nearly every day of the week. And they need to hear you cheering! Keep an eye on the calendar and find a game or two each week to go to. It's a great day to be a Mustang! "We, the members of the Dawson community, recognize that honesty, integrity, and trust are vital parts of our lives. We value truthfulness, respect for the property of others, and respect for the work of others as their own. We expect everyone within the Dawson community to uphold these standards in order to foster a positive and safe environment. We respect diversity and value each other’s differences. 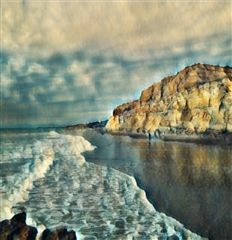 We will attempt to keep our actions, attitudes, and judgments in accordance with these tenets at all times. We hope these values will carry over to life outside of school." I will not lie, cheat, or steal. I will respect the rights and backgrounds of others and be open to diverse points of view. I will hold myself accountable for my actions at all times. THUR-SAT 7P - Dawson Theater Presents! 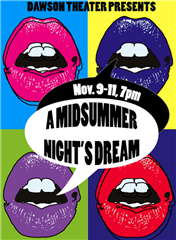 DON'T MISS IT: A Midsummer Night's Dream, like you've never seen it before! Thursday, Friday, Saturday - November 9-11 - 7:00 p.m. nightly. Open to the public; tickets just $5. POP on over! 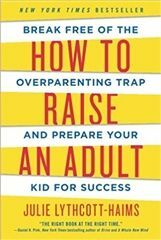 MONDAYS, OCT. 30, NOV. 6, NOV. 13, 7:00-8:30 p.m., US/MS Library: Following on the success of October 24th's presenation by author Julie Lythcott-Haims, Dawson will host a three-part followup discussion group based on HOW TO RAISE AN ADULT. Dawson and non-Dawson families are welcome; feel free to attend whether or not you have read the book. Dawson is entering a new era in its history and starting on exciting campus growth projects. Find info on the website, including FAQs, live construction webcam, and much more. 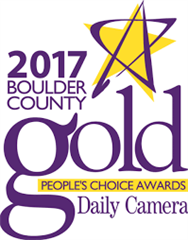 Dawson was again selected Best Private School in the Boulder Daily Camera's annual "BoCoGold" poll! Not only the Dawson community, but the wider community has recognized Dawson's outstanding educational program and contributions to the region. Also: Dawson Summer Camps bested stiff competition to be named Runnerup, Best Summer Camps - congratulations! These last weeks of school are jam-packed with final projects, exams, shows, performances, and post-season play. But from moving up to graduation, it is such a wonderful time of year to celebrate our students - not what they have done, but who they have become. Dawson is proud to have been a part of that journey. When it comes to finding the right school for your child, details matter. 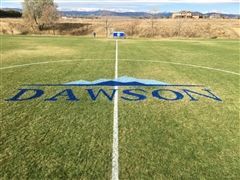 That’s what separates Dawson School from the others; attention to detail in educating and caring for students is what makes Boulder County parents interested in sending their kids to Dawson. 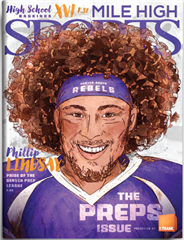 Founded in 1970, the school takes a multidisciplinary approach so as to ensure well-rounded students, while also providing opportunities for kids to pursue their educational and athletic goals. Dawson also focuses on bringing in global perspectives, with students from 22 countries represented. And world language lessons begin in kindergarten to encourage early learning. Now that’s getting a head start. April is National Poetry Month! So we invited students, faculty, families to write a Dawson-themed haiku. There were dozens of wonderful entries, and TWO grand prize winners: Summer Stone (5th) and Katrine Larsen (3rd). You can read all the wonderful entries on the Dawson Blog (link on the home page). The sun rises and sets. Be sure to check the Winterim / Immersion Blog 2017 regularly for updates on everybody's Winterim and Immersion adventures! Whether near or far, every student, K-12 will have some great hands-on exploration, learning, and fun to share. There is a link on the Dawson website homepage. New posts come regularly, so keep checking back! Dawson is honored to have again been named Best Private School in Yellow Scene magazine's recent readers poll. In Yellow Scene's poll, no choices are provided: Readers are simply asked "Best Private School?" and name who they feel merits the title. We are thrilled that Dawson's leading-edge academics, as well as strong athletics, arts, and experiential education, kept us top of mind! Dawson Makes TOP 10 In Mile High Sports! 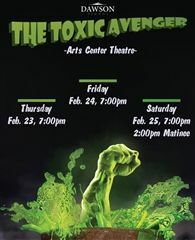 THE TOXIC AVENGER IS COMING!!!! Thursday, February 23 - 7:00 p.m.
Friday, February 24 - 7:00 p.m.
Saturday, February 25 - 2:00 p.m. and 7:00 p.m.
From our talented Upper School theatrical and musical arts departments! MARK YOUR CALENDAR! 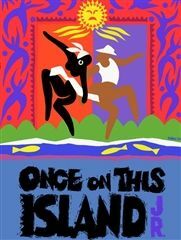 The annual 7/8 musical is Once On This Island Jr., being performed Thursday, February 9, 7:00-8:15 p.m. The show is rated G and great for ages 6+. Free; in the Arts Center theater. Make a night of it! 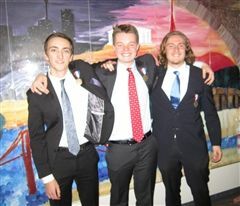 CHSAA 2017 Speech & Debate State Festival Tournament: After a grueling two days, Dawson walked away with TWO state titles: senior Wyatt Thomas took first in Lincoln Douglas Debate and juniors Ben Deitsch & Sean Costello took first in Public Forum Debate! Thirty Dawson students competed against the state's best-of-the-best, with many earning medal recognition. Congratulations, team, on another fantastic season! 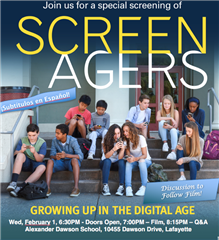 Dawson is pleased to be one of the area schools presenting the documentary "Screenagers: Growing Up in the Digital Age"on Wednesday, February 1, at 7:00 p.m. This is part of Parent Engagement Network's (PEN) series of screenings on this important topic. Following the film, Ryan Dawson, MA, LPC, of Boulder Psychological Services, will lead a Q&A discussion. Ryan Dawson specializes in working with youth and adults on screen addiction, and has been a popular speaker at Dawson in the past. The documentary will have Spanish subtitles, and an American Sign Language interpreter will be provided. Run time of the film is 67 minutes. In keeping with the other schools, tickets are $10 for adults and $2 for students. 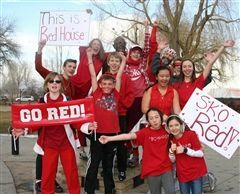 Dawson School has a long tradition of incorporating community outreach with learning, starting in the earliest grades. Recently, first grade hosted a successful bake sale on campus, raising $400. The students then employed math skills and thought about healthy choices as they shopped at Lucky's Market in Longmont, using a shopping list of much-needed items from the OUR Center. Longmont's OUR Center helps people move toward self-sufficiency by bringing together resources from the community. 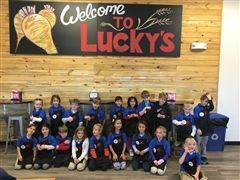 Lucky's Market graciously matched the money the students raised: Empathy and awareness were spotlighted as the first graders personally delivered 591 pounds of non-perishables to the OUR Center! 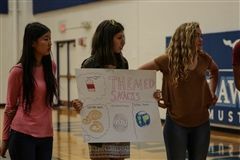 Dawson students in AP Human Geography tried to put themselves in the mindsets of refugees and migrants last week through a series of special classroom and outdoor exercises. Students were first asked to create stories capturing the likely hardships and challenges that such journeys create. Then history teacher Craig Angus had each student enact 'A Syrian Refugee's Perilous Journey': Angus provided the students with a variety of outcomes, provided them with 'money' from different cultures, created an element of randomness and luck through having students roll a die to learn the next step of their journey, and utilized Dawson's high ropes challenge course to drive the point home. 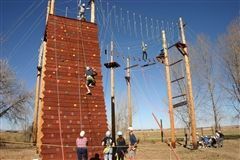 The challenge course represented different portions of the journey, and students were required to traverse various elements in order to complete safe travel to 'France,' 'Canada,' or 'the United States.' Students received bonus points for arriving to safety; not all students were so fortunate. But even if just for one day, every student had a vivid experience that drove home the messages of risk and hardship that most refugees endure every day. Recognize these? We have lunch underneath these flags every day, but do you know what they represent? 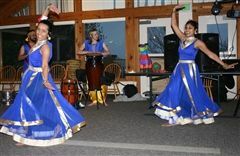 Over its 47-year history, Dawson has enrolled students from many countries - and those countries are each represented here. If you are attending Dawson from a country that is not included here, please let us know, so that we can add your flag! 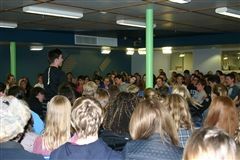 On Wednesday, October 5, Dawson students in grades K-12 participated in a civil discourse exercise. The goal was learning to debate respectfully while also practicing the art of listening and formulating persuasive arguments. This fall saw a record number of colleges and universities coming to campus to meet with Dawson students. Over 130 schools, big and small, from all parts of the country, as well as international, took time to meet with interested juniors and seniors and college counseling staff. 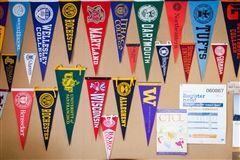 At Dawson, we believe that college is a "match to be made - not a prize to be won," and we encourage our students to look at a wide array of options. It is a huge compliment that Dawson is such a popular stop! 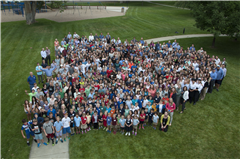 Dawson School has set yet another record for enrollment: We started the year with 527 students in K-12! Looking forward to a fantastic year for all. It's a great day to be a Mustang! Dawson's first Mustang Day was memorable! All students and faculty, K-12, formed mixed-age groups. Lower School students gave tours and insights about their experience; then groups brainstormed things and processes that could make life even better for K-6. Groups presented ideas to each other, and Dawson will consider implementing top contenders. Creative teamwork! 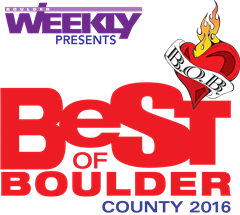 Dawson Voted "Best of Boulder County" for 10th Year! 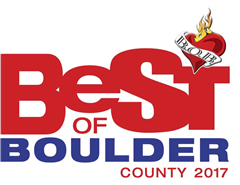 Dawson School was voted "Best of Boulder County" for the 10th year in a row! 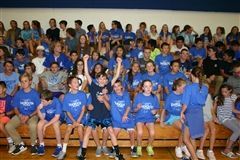 "With a rich history of private education in Boulder, BW readers once again voted Dawson School the best private school for kids kindergarten through grade 12. With a strong emphasis on college prep, it’s Dawson’s mission to challenge 'students to achieve excellence of mind, body, and character.' With a further commitment to the community and the virtues of respect, compassion, courage and integrity, this private school provides opportunities for every child to succeed. Children are our future and with places like Dawson around our future is sure to be bright." This is a one-time step, unless you have forgotten your username or password; if so, you will follow this same setup step again to reset. Then you can begin surfing the resources, including your student's schedule, assignments, and more.